To a recent high-school graduate, or a returning adult student who hasn’t been in a classroom in a long time, college can seem like another world. The expectations for behavior, the cultural norms, and the jargon may be new and confusing. The strangeness of this new experience can be very obvious when it comes to communicating with professors. It can be intimidating, but if you want to succeed in college, you’re going to have to talk to your professor some time. You pay money to go to college, but college isn’t like any other service you pay for – you have to work to get your money’s worth. Your professors are not servers there to wait on you hand and foot; they are authority figures. They’re not exactly your bosses, either, because they’re not paying you to do a job – if you don’t do your work, it doesn’t hurt them, only you. At best, your professor is a knowledgable expert on whatever you are learning, who will guide you to better understanding and expertise on that subject. They can inspire you to perform at your best, like a good coach, or they can make your life miserable, like a bad boss. Sometimes the difference comes down to how you communicate with them. And some absolutely are. The image of the super-stern professor who demands respect is a stereotype because it’s sometimes true, and was a lot more true in the past than now. 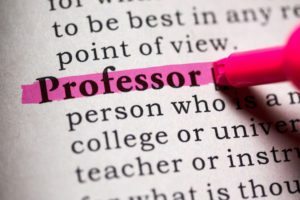 But the thing to remember when you’re communicating with your professor is that professors are people – “professor” is a job, not a personality type. And just like every other person in the world, every person is different. Your professor may be easy-going. She may be very funny. He may be very soft-spoken. A professor can be an extrovert or an introvert, open-minded or authoritarian, familiar or formal. They may be confident, awkward, or cautious. They may still get nervous getting in front of a class after 20 years of teaching. The thing you have to remember, though, is that the professor has a lot of authority in the classroom, and she or he will be the one grading your work. And, unlike the high school teachers who had a duty to do everything possible to get you through class, the professor does not have that job. The professor’s job is to present information, knowledge, and ideas to you. Your job is to learn. So it’s in your best interest to communicate effectively with the people who will be leading you in some of the most important years of your life. Let’s repeat that for emphasis: respect is key. Most professors don’t make a ton of money, unless they’re in the Ivy Leagues. They don’t get paid for publications, they have to work on committees without any extra pay, and many of the people who teach you are not even going to have full-time jobs (more than half of college courses are taught by part-time adjuncts). They do what they do because it makes them feel fulfilled, and respect is a big part of that. So until you get to know your professor, it’s a good idea to take a formal tone. It’s like this – being cautious and polite can’t hurt you, but starting out too familiarly (and risking insulting the professor) definitely can. Once you get to know your professor a little better, you’ll learn if they like a more comfortable, collegial relationship with their students, or a more formal, less close relationship. If you have the same professor multiple times over the years, you may grow into a more familiar relationship. But until you know that professor well, make sure to address them as “Sir” and “Ma’am,” as “Dr” or “Professor,” whatever is appropriate to the situation. When Dr. Smith tells you “Call me Sue,” then you can call her “Sue.” Not before. That doesn’t mean every email needs to be 2000 words long; it means that every time you email your professor, it’s part of the class, and it influences how your professor thinks of you, even if it’s not being graded. Always include a subject line, and make it as specific as possible without being too long. Professors get a lot of emails and subjects make it much easier to scan and search. Address the professor formally and politely: “Dear Dr. Smith,” for example. It can just be a simple, businesslike “Dr. Smith.” Addressing the professor lets her know that you acknowledge her as a person and not just an email-answering machine. Try your best to write correctly. You can’t imagine how important this is. It doesn’t have to be absolutely perfect – email is understood as an informal communication, and isolated mistakes may be overlooked – but do your level best to have complete sentences, correct spelling, and punctuation. It’s frustrating to have to interpret texting-language and emojis into a coherent message. Close politely with your name. “Thanks” is a polite way to close. Not “Love” – you’re not writing to your grandmother. Include your name, because sometimes your email address isn’t close enough to your name for the professor to recognize, and if your professor has dozens of students every semester, you can’t be sure they will remember you. Some professors make these into rules, and take a hard line on the rules; there are some who will even refuse to answer emails that don’t include subjects, have lots of grammatical errors, or don’t address them respectfully. Others will just be annoyed and remember you were the one who annoyed them. Don’t be the person who makes the professor sigh when they see an email from you. Some professors will give you their personal phone number aside from their office number. This is a terrible mistake, but some will make it. The smarter professors will give you specific times that you can call, like out-of-office office hours. If they do give you a time frame, DON’T CALL THEM ANY OTHER TIME. Respect their off-time and privacy and only call when absolutely necessary. Many professors have begun embracing text messaging as a less invasive way of making themselves more convenient and available. The same basic rules apply: most professors don’t keep college student hours, so don’t text them at 2am when you’ve had a brilliant insight into non-Euclidian geometry or post-modern rhetorical theory. You’ll get yourself blocked. As for the no-texting-speak rule above, that may actually apply to texting your professor too. Write things out so they are clear, and never, ever send a winking emoji to a professor. That’s way too ambiguous and will cause nothing but trouble. There are many kinds of college students, and, like professors, they are all different. Some will be overly familiar with their professors right away, acting too personal and making their teachers uncomfortable. Others will be too timid, and never want to communicate with the professor at all. Most people are going to be somewhere in between – not always sure exactly what to say or how to say it, but making an effort to communicate. Here’s the thing: you have to practice communicating with your professors if you’re going to get the most out of college. In class, if you are quiet all the time, your professor will probably assume you understand everything, and possibly even ignore you to focus on the students who have more needs. If you have problems, or don’t understand something, it could be too late before the professor steps in and makes you talk. If you’re not comfortable talking in class, email – many professors prefer that anyway to a barrage of questions in class. If you’re more comfortable one-on-one, meet your professor in person during office hours. Your professors want to see you succeed, and will help you get there, but it usually requires you to come to them first. The bottom line: if you’re struggling with a class, communicate. If you’re enjoying a class, communicate that too; your professors like encouragement just like everyone else. Your professors will remember the students who communicated politely and effectively, and that will help you out in the long run: with a better grade than you might have earned otherwise; with a letter of recommendation for a job or scholarship; or even with a life-long mentoring friendship. And that’s worth the extra three seconds it takes to sign your name at the bottom of an email.